In contrast to the care and concern about legitimate descent and genealogy of the priestly and especially high priestly families in Jewish society at this time, it may be seriously doubted that there existed any families whose descent from the house of David could be confirmed. It doesn’t take very many generations before any Thomas, Diklah and Hur could claim some relationship to the old royal family. In connection with this latter thought, what I understand Horsley to be indicating is some of the later leaders of rebel movements (after Jesus) that appeared to mimic Moses or Joshua, for example. This, Horsley suggests, surely correctly, that there was more popular interest in the priestly revival than any notion of a royal deliverance at the time. Horsley then goes on to examine the conditions that led to the later rise of the tradition of a popular kingship to come. Certain learned groups, such as the Qumran community, he thinks, may have helped prepare the way. But that discussion will have to wait for a future time. Posted on 2011-07-21 00:10:43 GMT+0000 by Neil Godfrey. 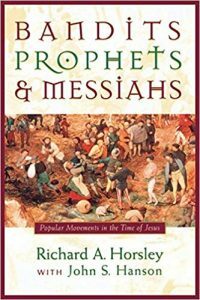 This entry was posted in Messianism and tagged Horsley: Bandits Prophets & Messiahs, Jewish Messianism, Messiah, Messianic Judaism, Second Temple messianism. Bookmark the permalink. It will be a little while before I can get to do more from this book, but Horsley’s answer in significant part — and certainly the one I think highly likely — is the defeat of the Jews in the war with Rome. Destruction and all that went with it — now that’s the sort of situation that one expects to produce either utter despair or unrealistic dreams. The earliest traditions about Jesus call him the messiah and say that he got crucified. Those two things are incommensurate. Now, they don’t seem incommensurate to people today, because people think the messiah had to get crucified because Jesus was the messiah and got crucified. But the idea of a messiah is a Jewish idea–that there’s going to be some future person sent from God as a savior for the Jewish people. What did Jews think this messiah was going to be like? If they talked about a messiah–well, there are actually different ways of understanding the messiah in the ancient world. Some people thought the messiah would be a great political figure, a warrior who would overthrow the enemy and set up God’s kingdom in Jerusalem–a powerful figure who would overthrow the enemy. Other people thought the messiah was going to be a supernatural figure, who was going to come from heaven to destroy the enemy and set up God’s kingdom. And there are a few other expectations. The one thing all these expectations have in common is that the messiah was going to be a powerful figure who overthrew the enemy. And how did the Christians portray Jesus? Not as somebody who overthrew the enemy, but somebody who got squashed by the enemy–who was tortured to death by the Romans. Now if you want to make up a story about the messiah, would you make up a story that he got squashed by the enemy and got crucified, the lowest form of execution in the empire. No, if you’re going to make up a story about the messiah, you make up a story–well actually he overthrew the Romans and that he’s the king in Jerusalem now. Well, why didn’t they make up that story? Because he wasn’t the king in Jerusalem, and everyone knew he wasn’t the king in Jerusalem. Everybody knew that Jesus got crucified. This is why Christians had the hardest time convincing people that Jesus really was the messiah. Because nobody expected the messiah to be crucified. But he says yah, but doesn’t the Old Testament say that he was abused for our iniquities–wounded for our transgressions, the chastisement for our peace is upon him, by his wounds we were healed, Isaiah 53? Yes, and look at Isaiah 53–read it sometime and ask: does it mention the messiah? In fact, it doesn’t mention the messiah; it’s not referring to the messiah. What about Psalm 22–“my God, my God, why hast thou forsaken me?” Yes, it isn’t talking about the messiah. Jews knew this, and Jews read these texts and said look, these aren’t even talking about the messiah. Christians said, yes they are; Jews said no they’re not, and this was the argument. The point is, the idea of Jesus being a Juh–the messiah–is a completely Jewish conception, but the idea that Jesus is crucified cuts completely against the Jewish conception of the messiah, which means if somebody made up the story of Jesus, they would not have made up the story of a crucified.messiah. The reason you get the idea of a Christian crucified messiah is because Christians said Jesus is the messiah, and Christians knew that Jesus got crucified, and Christians concluded, the messiah must be crucified–that’s the logic–but you wouldn’t make it up. If someone wouldn’t make up that story, where does it come from? It comes from there being a person Jesus that got crucified. So I think that is one argument. If you listen to the talk, you will find that Ehrman makes a lot of these statements very emphatically. I chose to emphasize the part that seemed most relevant here. Yet Horsley contradicts Ehrman’s statements here. Horsley points to the evidence pre-70 CE that the idea of a Davidic royal messiah was a remote end-time event for theological dreams, like the ending of our Revelation with God coming down from heaven to build a new earth. I have been pushing and searching to find the evidence on which claims like Ehrman’s are based — one encounters them so often — but have come up with nothing. I notice my scribblings in Horsley’s book are quite old. Maybe I was prompted to ask the question in the first place quite some time ago after reading him — I can’t remember now. The closest “evidence” for a “pre-Jesus expectation” are the rebel movements among Jews preceding the Jewish war. But surely those are symptoms of deeper socio-economic developments after the time of Jesus. We must not confuse them with common bandit problems, either. And rebel movements and banditry were hardly restricted to Jews under the Roman empire. Besides, some of those movements described by Josephus look to me more like mimicry of Joshua or Moses (e.g. expecting the Jordan to part) at least this is what Josephus wanted us to think). The next step in the argument is to say Josephus was too fearful or diplomatic to remind Romans of messianic movements among the Jews, which may have been the case — but his accounts of these movements can hardly be used as positive evidence for that. But even if it couldn’t be argued that Ehrman’s is all wet on the business about the messiah, I don’t think his argument would be a good one. It seems to me that the whole “if you want to make up a story about the messiah” argument seems rather phony. Recycling a story of a crucifixion is something rather different from just making up a completely new story, and Ehrman knew that, but he also knew that nobody in that particular audience was going to take issue with his argument. The gods Horus, Attis, and Osiris (and many others) had their crucifixion stories, so the idea that crucifixion was the “lowest form of execution in the empire,” if true, seems irrelevant. If it was a common thing for some gods to endure, why would it have been thought to be inappropriate for a messiah? Which other gods had their crucifixion stories? Christian reader, what can you now make of the story of the crucifixion of Jesus Christ but a borrowed legend — at least the story of his being crucified as a God? “Christian biblical scholars have often used stereotypes of ancient Jewish phenomena as foils for their own preferred Christian nova. For generations the stereotype of Pharisaic or rabbinic ‘works-righteousness’ and self-justification has been used as a foil for the Pauline (= Lutheran) doctrine of ‘justification by faith.’ The supposedly widespread and fanatical ‘Zealot’ movement or ‘Jewish nationalism’ has been used as a foil of violent rebellion over against which Jesus was then portrayed as a sober prophet of nonviolence or even nonresistance. Or the supposedly crudely ‘political’ Jewish messianic expectation has been used as a counterpoise for Jesus as the truly ‘spiritual’ Messiah” (Horsley, “Messianic” Figures and Movements in First-century Palestine, in: J. H. Charlesworth, ed., The Messiah [Minneapolis, 1992]). Bart D. Ehrman is probably falling into the same trap as Hengel. Yet it is the scholars who write within the frameworks of the traditional Christian stereotypes who seem to be the ones in the public eye the most. It was when I discovered this some years back that I was incensed enoiugh to start this blog and to try to do my bit to point out that such publications were not really were the cutting edge scholarship was at. Sorry, I don’t recall off hand the Old Testament verse that speaks of an end-time messiah being from the family of king David . . .?